The uniform shown here is for a Stabsarzt (Medical Captain) which is a special grade granted to members of the Medical Corps. The equivalent of a Stabsarzt in standard Bundeswehr service is Hauptmann (Captain). Considerable changes as shown on this uniform is the cuff title for the unit Jagdgeschwager Steinhoff (Fighter Wing Steinhoff), the lack of the French style cuffs and the yellow piping has been removed from the trousers. The visor cap is of Air Force blue with silver piping common of all officers below the rank of General, there is silver adornment on the visor itself signifying position as a commissioned officer but not the oak leaves of a senior ranking officer. The emblem of the Luftwaffe with wings emcompassed by a wreath rests in the center of the hat and the German national roundel emblem is positioned above that. The right side of the uniform displays Tätigkeitsabzeichen (Specialty Badges) the first one being the Fliegerarztabzeichen in Gold (Flight Surgeon Badge in Gold), also of note is the award of foreign badges including the United States Air Force Chief Flight Surgeon Badge the Bundeswehr allows its personnel to wear a maximum of two foreign awards and they are usually awarded through assignment or attachment with a foreign unit. The brustenhänger (pocket badge) is for the unit Jagdgeschwader 75 (75th Fighter Wing) which was assigned to Leiphem, in Bavaria, southern West Germany. 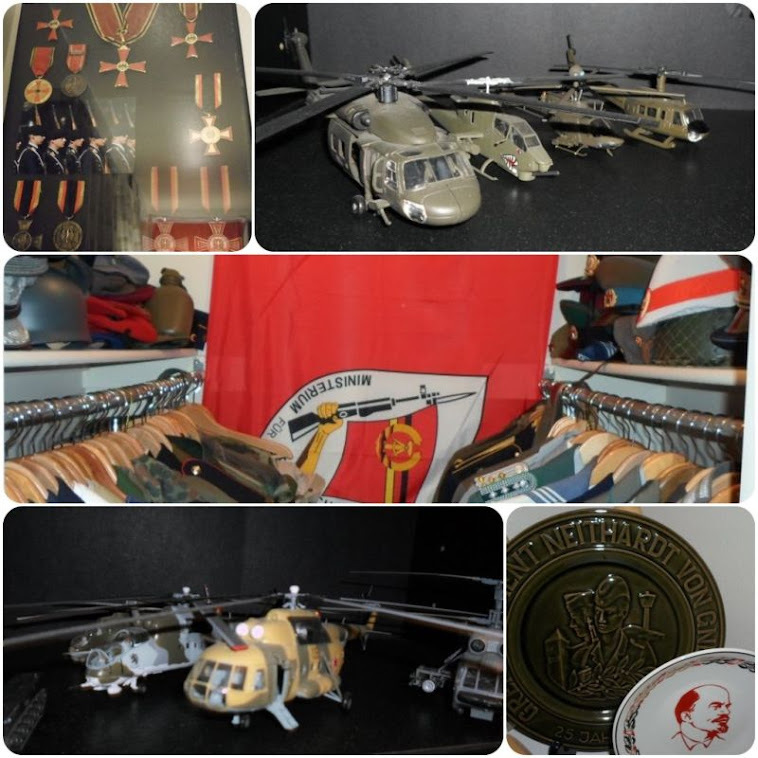 Upon reunification, the unit moved into the former East Germany in 1991 and became part of Jagdgeschwader 73 Steinhoff in 1993 which operated former East German Air Force MiG-29 Fulcrum jet fighters alongside F-4 Phantom II fighter aircraft. Note the U.S. Army Expert Marksmanship badge with Rifle clasp suspended below on the uniform pocket. The awards on the left side of the uniform include the Ehrenkreuz der Bundeswehr in Gold (Gold Cross of Honor), Ehrenzeichen des Deutschen Roten Kreuz in Silber (Order of the German Red Cross in Silver), Einsatzmedaille Fluthilfe 2002 (Flood Service Medal 2002) and the Deutsches Sportabzeichen in Gold (Gold German Sports Badge). On the breast pocket is the Das Abzeichen für Leistungen im Truppendienst in Silber (Armed Forces Badge for Military Proficiency in Silver). The shoulderboards retain the yellow gold piping of the Air Force with the specialized insignia of a Stabsarzt (Medical Captain) in the Medical Service with the snake coiled around a caduceus and three pips. With the disbanding of JG 75 in 1993, the unit became part of JG 73 'Steinhoff' in the former East Germany. The cuff titles here bear the name of the unit 'Jagdgeschwader Steinhoff' embroided in silver against a black background.